Stephen Rex Brown Angelica Kitchen at 300 East 12th Street. 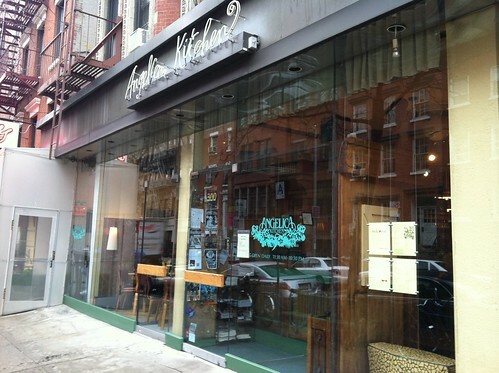 Officers from the Ninth Precinct ordered the staff of the popular vegan restaurant, Angelica Kitchen, to stop allowing customers to bring their own bottles — but it’s not clear why. The owner of the eatery, Leslie McEachern, said that the officers told a manager on Friday night to cease-and-desist B.Y.O.B. service, citing a complaint from Community Board 3. But the district manager of Community Board 3, Susan Stetzer, said she had never heard a complaint about the restaurant on 12th Street near Second Avenue since she took her job in 2004. Several calls to the Ninth Precinct were not answered, and the voicemail was apparently disabled. According to the letter of the law, restaurants offering B.Y.O.B. service must still have a beer-and-wine license. However, many restaurants do not bother. “My attorney likened it to jaywalking; it’s illegal but we all do it all the time,” said Ms. McEachern. She added that she was considering applying for the proper license, but hadn’t yet come to a decision. For now, customers will have to enjoy their tempeh reuben sandwich without a glass of red. Update | 5:40 p.m. Ms. Stetzer told The Local that the Ninth Precinct directly received a complaint regarding B.Y.O.B. service at Angelica. The Ninth Precinct once again could not be reached.